I have some very exciting news. 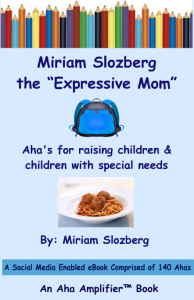 I was given the opportunity to create 140 quotes about parenting in general, as well as parenting children with special needs. And I took it and started creating these parenting quotes, and created a book of them, through the Aha Amplifier. The Aha Amplifier is a platform with books that has inspiring quotes, or “aha’s”. All quotes are no more than 140 characters, meaning they are meant to be Tweeted out. The purpose of the Aha Amplifier is that it helps anyone (authors, business owners, podcasters, anyone who wants to be influential in some positive way) create influence. Many people naturally love quotes, especially if they are inspiring and educating. As a result, people are ready to share them on Facebook, Twitter, LinkedIn and Google Plus. This really is a great tool for anyone to amp up his or her online influence! Here are a few examples of quotes I had tweeted out from my new Aha book! 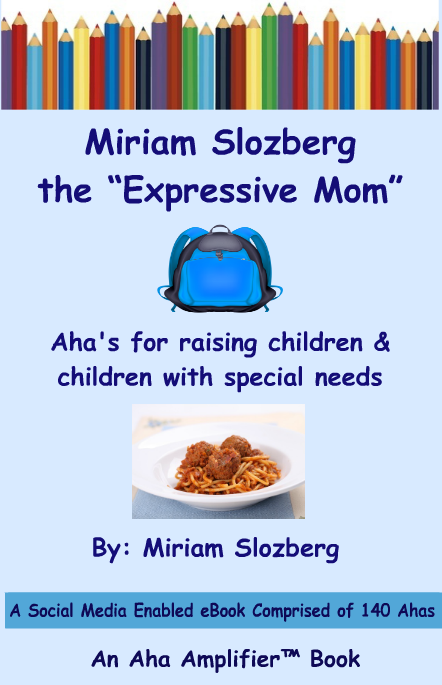 Be sure to check out Miriam Slozberg, the “Expressive Mom” Aha book, and hey, while you are at it- I would appreciate it if you tweeted a few quotes. What a wonderdful idea, Miriam! And it sounds like one that is right up your alley as well. 😉 Very inspiring! Thanks! It was fun to create!